Share "Repainting Your Home: Tips for the DIYer"
If your home’s paint is beginning to peel and crack, it may be getting difficult to avoid the age old question: Should I hire a painter or do it myself? That answer depends on a few things. First, do you know how? Painting your home is a job that is relatively easy enough for most homeowners to tackle. However, a homeowner must also have the available time, be in good enough shape, and must not be bothered by working on a ladder and/or scaffolding. If you think the architectural features of your home will require equipment, expertise and intestinal fortitude that you may not have, then there is no shame in hiring the job. However, if you are willing to give it a go, you could save about half of the cost of the job if hired out. That alone may be incentive enough! 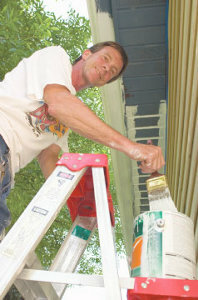 Take a stroll around your house and try to determine whether you are comfortable working on the trim from a ladder. Do you have one that can reach? Keep in mind that there are also scaffold systems that can be purchased or rented. If necessary, you can even rent a lift for those high areas. Take into consideration the locations of power lines as you decide your method of getting up there. As you walk around your house, keep an eye out for damage that needs to be repaired prior to painting. Is the paint simply peeling and cracking? How many layers are there? If your paint has taken on an “alligator” look, then the paint may be too thick and should be sanded down or stripped to ensure lasting results. Often, the “alligatoring” occurs when latex has been painted over old brittle oil-based paint, and the problem will persist -- even with a fresh coat. Flaking and peeling paint needs to be scraped. Be careful not to gouge the wood. To simply paint over these areas is only a quick fix, and your exterior will certainly continue to peel and flake shortly thereafter. Once all of the loose paint has been removed, sand the areas (a power sander is your friend here) until reasonably smooth. Be sure to wear goggles, gloves and a mask. Try to sand with the grain of the wood if doing it by hand. Disc sanders tend to leave curved scuff marks, so use them with caution. Orbital sanders work best. For detailed trim, “mouse” type crevice sanders are a great help. If loose or cracked boards are uncovered, now is the time to repair them. Countersink and fill any unwanted nails and nail holes. The entire surface should be dusted and cleaned. All bare areas should be primed with a quality primer. Many professional painters recommend priming prior to caulking for a couple of reasons. The caulk adheres to the primer much better than bare wood and it is easier to see the gaps that need caulk. Once the area is primed and caulked, take precautions to protect the objects and surfaces that you don’t want paint to drip on. Use painter’s tape, plastic sheeting and drop cloths for this. Whenever possible, you should always paint from the top down. Do eaves and fascia first, then work your way down the siding. Always paint with the grain of the wood. In areas of trim where two boards intersect, still follow this rule and paint along the grain of each board. When painting siding, work in manageable three to four foot sections, making smooth strokes along the grain. Immediately correct any drips and avoid lap lines by not allowing the paint to start drying before continuing across the length of the board. If you area running out of daylight and the job is not done, try to finish the length of the run of siding you are working on. It is best to leave the line of painted wood along the bottom edge of the board, rather than stopping the job mid-run. Make sure you completely clean your brushes and tools at the end of each day to ensure a quality paint job in the future and a longer life for your equipment. Latex paint cleans up with water and alkyd paints use paint thinner. Remember your old paint or used thinner shouldn’t be dumped down the drain. It is best to keep it stored until it can be disposed of properly at a collection site. Ever wonder what you should do if it starts raining when you’re painting? The professionals would say, “Well, pal, it shouldn’t be raining.” –meaning that you probably shouldn’t have started if rain was in the forecast. A good rule of thumb most pros use is: If the forecast is over a 40% chance of rain, than don’t paint. That being said, it can still happen. If it does, stop painting and cover all of your paint cans. Then, if it looks like the rain will continue, just clean up and be ready for the next day. If your latex paint hasn’t had at least 4 to 6 hours to dry, the surface may have been damaged and may have to be sanded and repainted. If bare wood has gotten wet, the wood should be completely dry before applying paint. Safety is important if you plan on using a ladder, so use caution. A good number to keep in mind is the 3:1 ratio. For every three feet of ladder height needed, the ladder should be placed 1 foot away from the house. That will provide a safe angle for climbing. Also when climbing, always have 3 points of contact. Two hands and one foot, two feet and one hand. Elbows, knees and such don’t count --just sticking with hands and feet here is probably a good idea! Always be aware of your surrounding when climbing a ladder. This includes power lines, wasp nests and the integrity of the surface your ladder is standing on and leaning on. 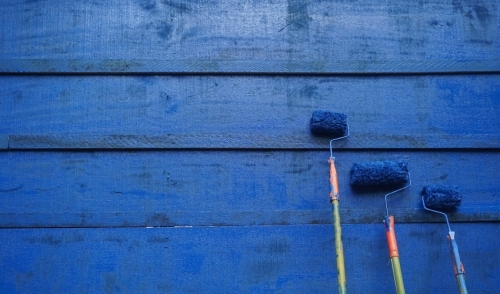 Feel ready to take on a painting job? With proper planning, the job can be accomplished quickly. You’ll be able to sit back and enjoy the satisfaction (and the savings) of doing the job yourself. Give us a call or stop in to discuss your project with our knowledgeable staff. We’ll show you which tools you’ll need and help select the right paint and perfect color for your home.